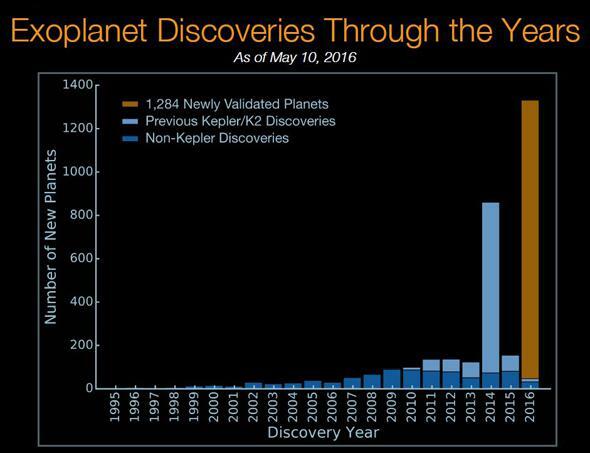 New release from Kepler reveals more than 1,200 new alien exoplanets. The sky must be filled with planets. Probably not this close together though. Astronomers working with data from the Kepler space telescope have announced the verification of a stunning 1,284 new exoplanets, worlds orbiting other stars. Even better, nine of them are at the right distance from their host stars (the “Goldilocks zone”) to have liquid water on their surface; that is, they’re potentially (so kinda maybe) habitable. I want to be very careful here. These planets have been verified using a statistical analysis, and each has been found to have a greater than 99 percent chance of being real. That’s very high confidence, but I’ll note that given how many were found, even a 99 percent chance means that some of them will likely turn out to be false positives. But that number will be low, and this new harvest is still huge, the largest single group of validated planets to date. So how was this done? These transits only occur for planets whose orbits are nearly edge-on as seen from Earth, which means that for every one we see, there are probably quite a few we miss. So Kepler puts a lower limit on how many planets are out there. Even so, quite a few have been found! Up until this latest release, more than 1,000 such transiting verified exoplanets had been dug up from the Kepler data. The problem is that word: “verified.” How do you know what you’re seeing is an actual planet? A lot of astronomical sources can muck with the data, creating false positives: things that look like planets, but are spurious. For example, some stars are binary, two stars orbiting each other. Some of these are eclipsing binaries; we see their orbit edge-on, so each star passes in front of the other every orbit. If they’re far enough away they look like a single star that goes up and down in brightness, just like an exoplanet transit. Some of those can be eliminated using various methods. But that still leaves a big passel of candidate planets—ones that might be real—that needs to be verified. Most of these stars are too faint to get reliable results from the ground (that’s why Kepler was launched into space! ), so observatories on Earth can’t always follow up. And looking at thousands of stars for the length of time needed to confirm the planets would take years. Decades. This is where the astronomers in the new study were clever. They took all the candidate planets in the catalog—7,470 “Kepler Objects of Interest”—and ran a statistical analysis on them. This included fitting a simple model to the transit plot, fitting various characteristics of the host star, and assigning predetermined probabilities that the transit is from some spurious source like an eclipsing binary. Out of the 7,470 input stars, their software ran successfully on 7,056 (the remaining 414 had other problems that made the software results untrustworthy). Of these stars, they found that 1,935 had a 99 percent chance or greater of being real, live transiting exoplanets. Of those, 651 had previously been determined to be real in the Kepler database. That left 1,284 possible exoplanets with a very high chance indeed of being real. As I said, a handful of these may yet turn out to be false positives, but the overwhelming majority are very likely to be real. The number of planets found by year; light blue is from Kepler, dark blue is from other observatories, and orange is the new release. Even more interesting, the transit shape and duration can tell you a lot about the planet. The diameter of the planet can be found by seeing how much light it blocked from the star; for example, a planet 10 percent the width of the star will block 1 percent of its light (because the amount blocked is proportional to surface area, which scales as width squared; 0.1 x 0.1 = 0.01, or one percent). The time it takes to transit tells you the orbital period, and that in turn tells you how far the planet is from the star. Because we know how hot the star is, that also tells you how much light is falling on the planet. Ah, and that’s where this gets interesting indeed. We can then calculate how much light (and heat) the planet receives compared with Earth. If the ratio of the light it receives compared with Earth’s is roughly equal to one, then we know that planet has a chance to be clement. It’s not a guarantee; a thick atmosphere might mean the planet is hotter than you’d expect, for example. But it’s a decent guidepost. 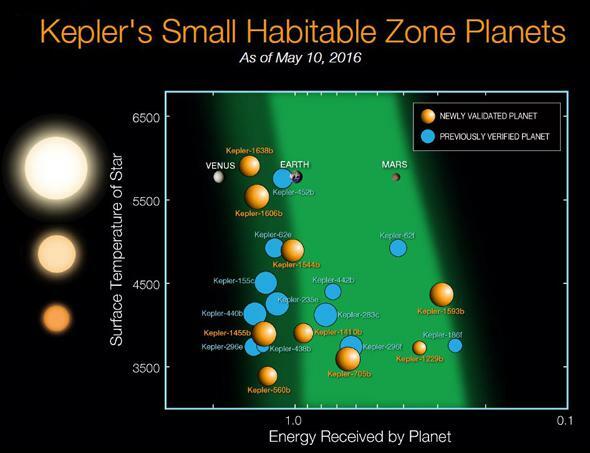 Known planets in the habitable (or “Goldilocks”) zone of their host stars. Blue marks previously known worlds, orange is from the new Kepler release. Note the positions of Earth and Venus. Nine such planets were found. All nine are larger than Earth, ranging from 1.12 to just under twice Earth’s diameter. There’s not much else we can say about them; they might have thick atmospheres, or none at all. They might be low density or high, or be totally different from Earth in some other manner. But the point is that they exist at all at the right distance from their star to possibly have liquid water on their surfaces. It’s a numbers game. The more planets we find like that, the more likely it is we find one that’s not just Earth-size, but Earth-like. 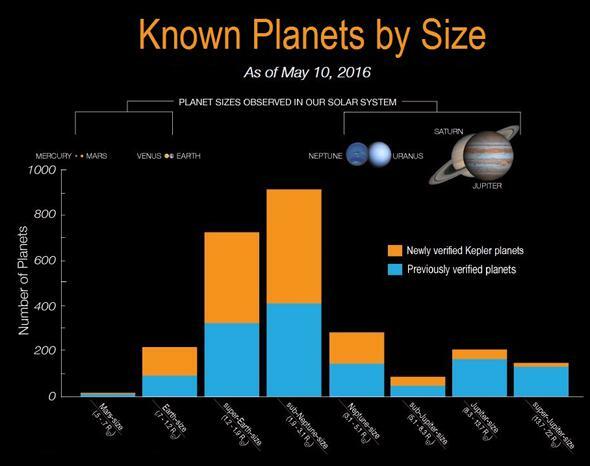 Planets known by size. 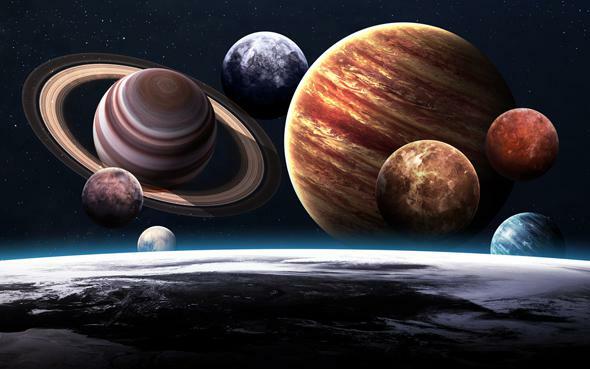 Along the top are the planets in our solar system; most planets fall between Earth and Neptune in diameter. And there’s treasure in the greater collection, too. For example, these new planets strongly support the previously determined fact that most planets orbiting stars are between the sizes of Earth and Neptune. At first, only Jupiter-size planets were found, because they were the easiest to see in the data. But as techniques improved, smaller planets were found. What’s weird is that in our own solar system, there are no planets in size between Earth and Neptune! For some reason, our home doesn’t have the most commonly found kind of planet. Is that significant, or coincidence? Only more data will tell. Remember, the first confirmed exoplanet orbiting a Sun-like star was only found about 25 years ago, and Kepler only looked at a small section of the sky. What will we find when we broaden the search to not just 150,000 stars, but 150 million? A billion? All I know is that we’ll find a lot more planets. The one thing all these data tell us for sure is that planets are incredibly common, and probably outnumber the stars in the sky. The Universe is filled with planets, and we’ve just figured out how to find them. There are a lot more to come.